Wooden Elephant are an international ensemble that reworks seminal ‘pop’ albums in new and inventive ways. They present electronic-based music of elephantine proportions on nothing but their wooden instruments. They also feature the acclaimed Irish traditional and classical violinist Aoife Ni Bhriain as violinist. So far they have arranged, recorded and toured two major albums of the last twenty years: ,Bjork – Homogenic, Radiohead – Kid A, BeyonceÌÂÂÂÂ – Lemonade. 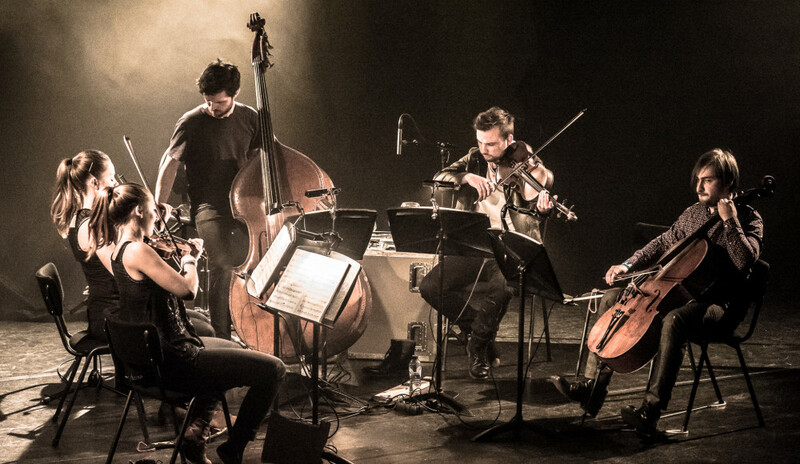 Wooden Elephant violist/composer Ian Anderson worked with Radiohead’s Jonny Greenwood as part of the London Contemporary Orchestra, culminating in a tour across Europe and Russia with Jonny’s string music, and appearing on Radiohead’s latest album A Moon Shaped Pool. Along the way Jonny – alongside LCO directors Rob Ames and Hugh Brunt – continually experimented with sound production techniques, and his whole approach to music creation has had a massive influence on Wooden Elephant. The group have incorporated many of those ideas that he explored with the London Contemporary Orchestra, as well as adding many more of their own that they developed during the Homogenic and Kid A sessions. Wooden Elephant use extended string techniques to offset the challenge of translating electronic sounds onto acoustic instruments. They also have used an array of trinkets, children’s toys, and small instruments to create yet more intriguing sounds.